Published by AT&T Services, Inc. Need a cup of coffee, want to find a good pizza place in town? Like to read reviews before choosing a restaurant? The YP app is your easy-to-use guide for local info near you. Search. Find. And Save Local! 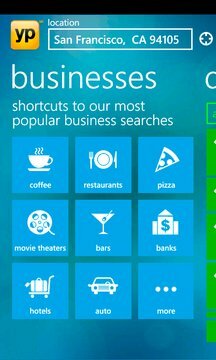 • Find businesses faster with predictive text, and quick links to top categories. • Location detection pinpoints where you are to automatically deliver nearby search results. • Get the scoop from other locals. Access comprehensive business listings including ratings, reviews, business details, open hours, videos or click to the website. 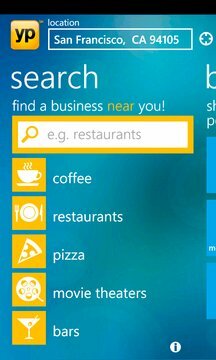 • Share businesses you find with friends via text, email, Facebook or Twitter. * Some restrictions may apply. Please call first to confirm the business will accept this coupon. Not all businesses accept mobile coupons.